I am passionate about genealogy. I think this comes from the need to have something that belongs to me but also many others at the same time. I enjoy that the people in my family tree are "my people." Yet, I am also fascinated by the fact that "my people" belong to many other people with traditions, memories and stories very different from my own. To me, the most interesting part of genealogy is the stories and events that go with each ancestor. Genealogists often focus on the facts: birth/death dates, marriage dates, number of children. But I don't often hear about The Meat on the Bones. 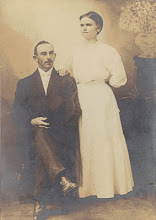 I have worked on my particular family tree for years, but have just recently discovered how much more interesting it is to know what the lives of my ancestors were like, rather than just knowing that they "were." Walking in their footsteps, literally, helps me to feel closer to these individuals than any headstone ever could. I have found many interesting and helpful resources through my family heritage travels and look forward to sharing these with my fellow genealogists. If I help only one person add some meat to their ancestors bones I feel I will have fulfilled a need to help others find their people.